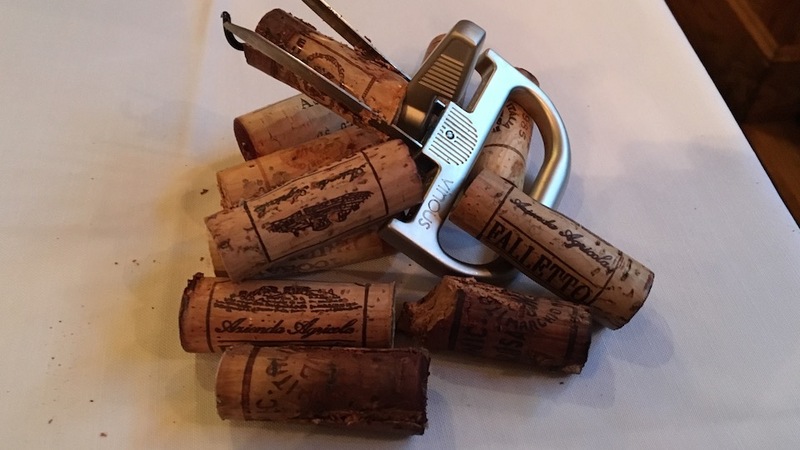 I was thrilled to receive an invitation to join a group of avid Piedmont lovers, many of whom I have known personally since the early days of Piedmont Report, for this remarkable tasting of wines from Bruno Giacosa. We all brought bottles from our cellars organized around several loose themes and enjoyed them over a delicious dinner at DeGrezia in New York City. Founding Vinous has been incredibly gratifying for many reasons, not the least of which is seeing the lifelong friendships that are formed by wine lovers with shared interests. My father introduced me to the wines of Bruno Giacosa when I was in high school. In those days, my parents owned a food and wine shop. They sold a number of top wines, but my dad always had a gleam in his eye when he brought a bottle of Giacosa Barolo or Barbaresco home for dinner. As I got older, I often turned to the Arneis or the more affordable Dolcetto, Barbera and Nebbiolo d’Alba bottlings before I graduated to being able to afford the Barolos and Barbarescos myself. Numerous visits with Giacosa and his longtime winemaker Dante Scaglione remain vividly etched in mind as some of the greatest tastings of my life. Even though being late is part of Italian culture, I was never late to a tasting with Bruno Giacosa. I did not want to miss a single minute spending time tasting with him, which I regarded as a privilege. The setup was always the same. A large strip of butcher paper covered a long rectangular table that gradually became covered with glasses as we tasted through numerous wines in bottle and barrel. Scaglione methodically jotted his impressions down directly on the paper. I preferred a laptop. Even before he fell ill, Bruno Giacosa was a man of very few words. The suggestion of a smile occasionally appeared, but only when a wine particularly pleased him. Pointed questions elicited short, succinct replies. Even so, Giacosa’s immense pride in his work was evident. Words were not really necessary. The feeling in the room was more than enough to understand everything. I often walked out of that tasting room with goose bumps. The wines were every bit that emotional. And the quality of the young wines was always evident from the very first taste. Over the years, I have had the good fortune to taste most, if not all, of Giacosa’s masterpieces along with many wines from unheralded vintages that are testaments to his unique genius. Today, Giacosa remains one of the most heavily represented producers in my cellar. If he is not at the very top, it is only because I have depleted most of my stock of older vintages. It is no secret that the winery has floundered since the 2008 vintage, but, perhaps for sentimental reasons, I prefer to focus on the positive than the negative here. 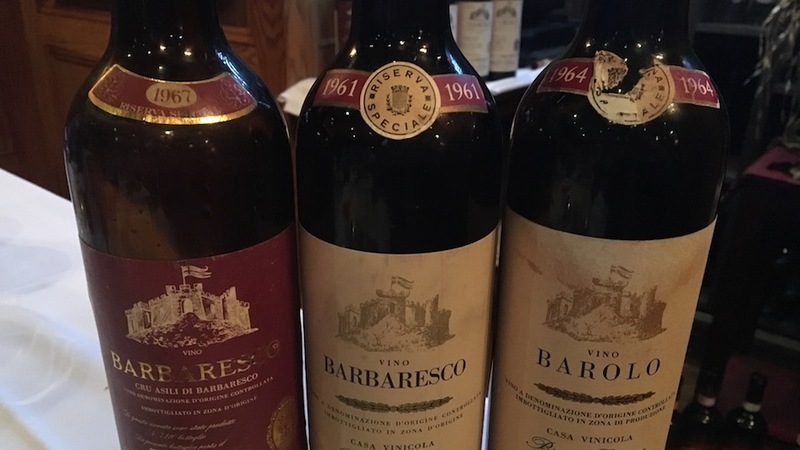 For more historical information on Bruno Giacosa and his wines, readers may want to revisit this comprehensive retrospective of the iconic Barbaresco Santo Stefano, which was held on two consecutive evenings in Piedmont last year. As always with a tasting such as this one, there were a few flawed bottles, but overall we were lucky to enjoy a wide range of stunning Barolos and Barbarescos. The night gets off to an amazing start with these two exceptional wines. Bruno Giacosa made his first Barbaresco from Asili in 1967. Although Giacosa worked with many top-notch sites in the intervening years, amazingly, he did not make another Asili until 1990. In 1996 Giacosa purchased a plot in Asili and went on to produce a number of stellar Barbarescos from this storied vineyard. With its sandy soils, Asili is a a site that is ideally suited to Giacosa's search for aromatic intensity and inner sweetness, qualities that are found in all of his finest Barbarescos and Barolos. The 2004 Barbaresco Riserva Asili is every bit as spectacular as it has always been. I remember tasting the 2004 with Bruno Giacosa and Dante Scaglione before it was released, and making a note to buy as much of the wine as soon as it hit the market. I have never regretted that decision. Explosive, deep and powerful, the 2004 Asili will reward readers lucky enough to own it for several decades. On this night, it is simply sublime. Not surprisingly, the 2004 is also one of the favorites of the group. Giacosa’s 2007 Barbaresco Riserva Asili is flamboyant, exotically ripe and stunning in its absolute beauty. Bright red cherry fruit, rose petal, violet and mint abound in a spellbinding, utterly thrilling Barbaresco. I have always adored the 2007. Once again, it is pure magic. The 2001 Barbaresco Riserva Rabajà is another wine I tasted many times before it was released. It is, in my view, one of the greatest wines Bruno Giacosa has ever made. That said, there is some variation in the 2001 that is probably attributable to different suppliers of cork. Although this bottle is not as thrilling as others have been, there is still plenty of the darkness, depth and structure that are such Rabajà signatures. Firm tannins ensure the 2001 will drink well for many years and decades to come. I often enjoy Barolo and Barbaresco on the younger side, but the 2001 Rabajà is a bottle I would prefer to continue to cellar for at least another few years. In the mid 2000s, Giacosa made several fabulous Barbarescos from a parcel he labeled as being in Rabajà, but that was later placed within Asili when the Menzioni Geografiche Aggiuntive (the approximate Italian equivalent of the French ‘cru’) were drawn up a few years ago. Bruno Giacosa’s amphitheater-shaped Falletto vineyard is one of the most dramatic sites in Serralunga, and all of Piedmont, for that matter. This steep, hillside vineyard often yields Barolos of gravitas and intensity, as is evident in the 1996. The 2000 Barolo Riserva Le Rocche del Falletto is soft and quite open in feel. It also shows a slightly roasted quality it has always had that is a hallmark of this warm vintage. Sweet red cherry, smoke, leather and tobacco add shades of nuance throughout. Although not likely to be a long-term ager by Giacosa standards, the 2000 is quite enjoyable tonight. The 2008 Barolo Riserva Le Rocche del Falletto is served blind. It doesn’t matter. The wine is awkward and deeply disappointing, as it has always been. I first tasted the 2008 Riserva in November 2009. Right then I knew there was a problem. But I hoped the wine would come around. It never has, and it never will. Grainy in feel, short and completely uninteresting, not to mention galaxies away from being in any way profound, the 2008 Riserva is among the weakest wines Bruno Giacosa ever put into bottle. Giacosa’s 1996s have always been epic. What a treat it is to taste and drink two of them side-by-side. Both wines are among the group’s favorites. The 1996 Barbaresco Riserva Asili is a total pleasure bomb. Time has softened the tannins nicely. What comes through is an extraordinarily beautiful expression of Nebbiolo from one of Barbaresco’s top sites. At nearly twenty years of age, the 1996 is fresh, nuanced and captivating in every way. 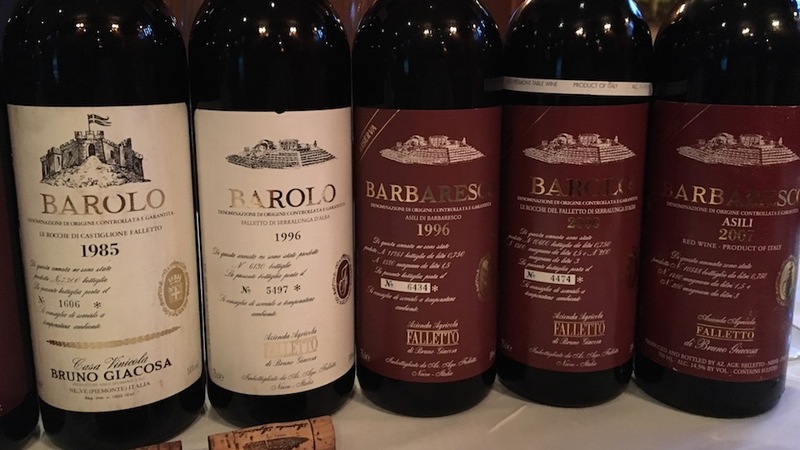 The 1996 Barolo Falletto in this tasting is the white label, not the epic Red Label Riserva, but that does not matter much, as the wine in the glass is staggering in its depth and pedigree. Beams of tannin give the wine its shape, while a host of super-classic tar, rose petal, incense and orange peel notes literally soar out of the glass. All of the pedigree of this great vintage comes through loud and clear. 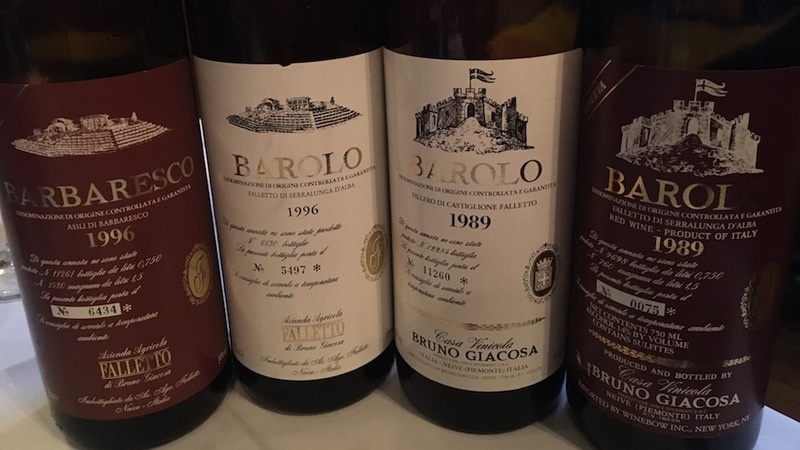 Bruno Giacosa’s 1989s are among the greatest wines I have ever tasted from any region in the world. At their best, the 1989s possess rapturous inner sweetness and perfume, not to mention extraordinary balance. On this night, though, we had mixed success. The 1989 Barolo Villero has long been one of my favorite Giacosa wines among Barolos that don’t quite reach the level of the truly epic. Intensely perfumed, silky and giving, the 1989 remains quite fresh and nuanced, not to mention absolutely delicious. The classic austerity and persistence are striking. Sadly, our bottle of the 1989 Barolo Riserva Falletto is flawed, almost certainly damaged by poor storage at some point during its life. 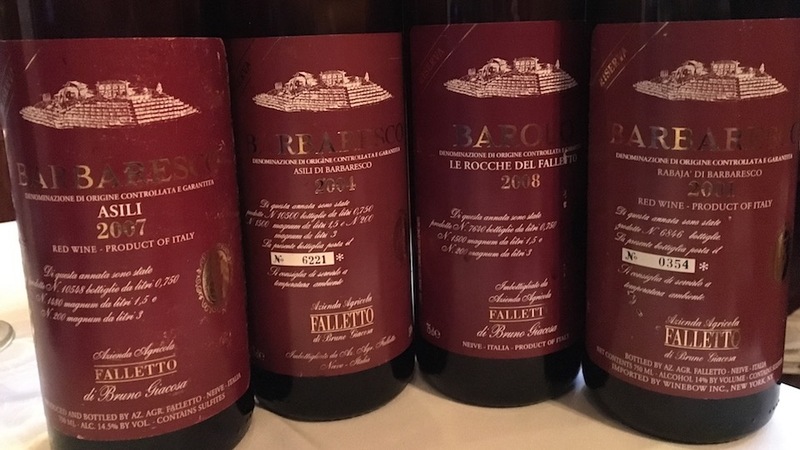 In Castiglione Falletto, Giacosa is most often associated with his Barolos from Villero, but he made equally compelling wines from Rocche as well. The 1971 Barolo from that vineyard is easily one of his all-time greats. The 1985 Barolo Rocche di Castiglione Falletto is such a joy to drink, as it expresses all of the radiance that makes wines from this vintage so alluring. Dark red cherry, plum, Christmas cake, tobacco and leather overtones abound in this racy, exotic Barolo. Soft contours add to the wine’s undeniable charm. From a pure pleasure perspective, the 1985 is one of the most enjoyable wines of the night. Unfortunately, the 1985 Barolo Riserva Falletto is oxidized. This one hurts. Giacosa’s 1980 Barolo Rocche di Castiglione Falletto is perhaps a bit past prime, as it is delicate, ethereal and a touch fleeting. Even so, it is quite pleasing. There is clearly no upside left from further cellaring, but the 1980 is enjoyable in this context. Nineteen eighty-six has long been one of my favorite Barolo vintages. Severe hail in May meant the wines of that year were made from the second budbreak and tiny yields, which resulted in unusually deep, concentrated wines. With its intense, almost exotic fruit and overall richness, the 1986 Barolo Rocche di Castiglione Falletto is a picture-perfect example of the year. Hints of tobacco, wild flowers and leather add aromatic nuance. What a beautiful wine this is. Many years ago, Bruno Giacosa told me he preferred his 1986s to his 1985s, after which I went out and bought all the 1986s I could find. The 1979 Barolo is one of the most surprising and pleasing wines of the night. Of course, Piedmont cognoscenti know that 1979 is one of the great under-the-radar vintages. But this wine is a straight Barolo, not a single-vineyard wine, which makes its strong showing in this tasting all the more remarkable. Vibrant and full of life, the 1979 remains fresh, delicate and gorgeous, with striking translucence. Wow. An old school-classic, the 1978 Barbaresco Santo Stefano more than lives up to its reputation. I did not taste the White Label Santo Stefano as part of a recent nearly complete vertical, so it is a pleasant surprise to see it on this night. Explosive and dense on the palate, the 1978 possesses remarkable intensity from start to finish. 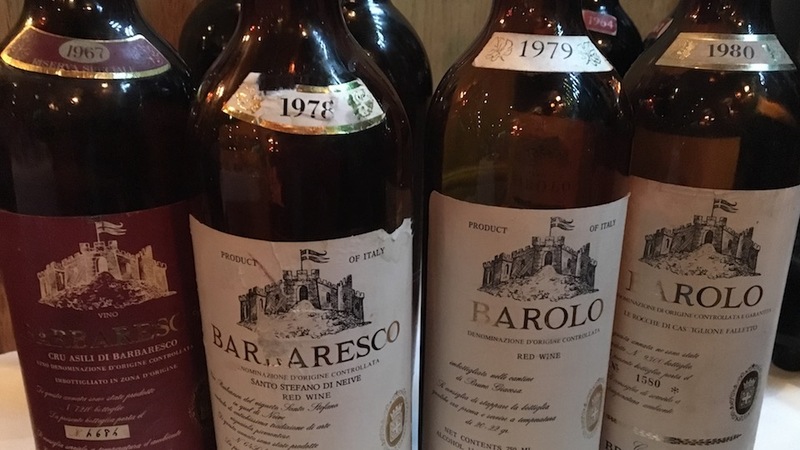 Nineteen seventy-eight produced epic, long-lived Barolos and Barbarescos. Giacosa was at the peak of his powers. The three Red Label Riservas from that vintage – the Barolo Villero, Barolo Collina Rionda and Barbaresco Santo Stefano – remain among his most epic and riveting wines. All of that pedigree and class comes through in the white label Barbaresco Santo Stefano. It is one of the most memorable wines of the evening, not just for me, but for most, if not all, of the group as well. It’s a real pleasure to share my last bottle of the 1967 Barbaresco Riserva Asili with this group. I have been fortunate over the years to drink numerous bottles of the 1967. This is a superb bottle of the 1967. Its color and overall integrity are far better than most other examples I have seen. Gracious, delicate and nicely softened by time, the 1967 Asili is sublime. Hints of orange peel and cranberry add aromatic lift, but the 1967 is like a slightly faded flower. Its time has come. The 1964 Barolo Riserva Speciale is powerful, dense and surprisingly structured for a wine of its age. Still quite deep and layered, the 1964 has aged exceptionally well. Nineteen sixty four is remembered as a year of both very high quality and generous yields. It would be a massive understatement to say that Giacosa’s 1961 Barbaresco Riserva Speciale is a rare bird. The ’61 Riserva Speciale is a wine of historical significance for at least two reasons. It is the first wine Giacosa made under his own label, and also the product of a vintage that was considered very ripe and high in alcohol for its time. I have only had it a few times. This is not a perfect bottle, but its importance and the generosity of the person who shared it make it very special just the same.